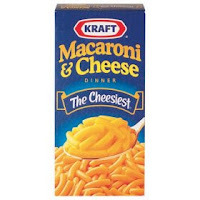 I probably shouldn't admit this, being a self-proclaimed foodie and all that, but I love Kraft Macaroni and Cheese. I do. Yes, the blue box stuff, the neon orange stuff, the there's-no-cheese-in-that-mac-and-cheese stuff. I can't help myself. It think it's because it was the first thing I ever learned to "cook," and it's comfort food. In a box. In less than ten minutes. I make mine a certain way, and my graduate school roommates love to tell (and retell) the story of the first time I gave them my Kraft-making instructions, apparently with gestures. "Firm but watery" is what they claim I said, that drunken night when we had little money for food, but plenty for cheap wine. "Firm but watery" actually is how I like it, which is why I ignore the directions on the box and cook my Kraft elbows for only five minutes (firm) and add 1/3 (not 1/4) cup of lowfat milk (watery), then eat it straight out of the saucepan. And while I gave my school cafeteria a bad rap several posts ago, they make a mean mac-n-cheese. They sprinkle in tons of garlic salt and garlic powder, then top it with garlic croutons, so when I see it coming up on the monthly menu, I buy some mints and gum and indulge. I try not to think about the calories I'm ingesting as I fill myself up with that cheesy, garlicky goodness. I'm not even sure it falls under the new state department of education's "healthy foods only" guidelines, but what can I say? I don't really care. It's yummy. These two very different macaroni-and-cheese "meals" don't belong in the same category as most, like the one my mom makes, like ones that everyone's mom makes. These are beyond comfort food - they are guilty pleasures. Shhhh. Don't tell. There was a guy who would eat this every night for dinner post-graduation from college. It was an amazing feat. The Kraft shells and cheese are pretty tasty too!